The Yin and Yang of Korean cuisine. A well-planned traditional Korean meal includes sweet, sour, bitter, hot and salty tastes. It may even strive to include all the colors green, white, red, black and yellow—representing the five basic elements of the yin-yang principle: wood, metal, fire, water and earth. While modern science hasn’t shown a clear health benefit for this approach, “the idea of getting a variety of foods—and not too much of any—makes intuitive sense,” says Kathryn Sucher, Sc.D., R.D., professor of nutrition and food science at San Jose State University and co-author of Food and Culture (Thomson Wadsworth, 2008). The principles dovetail neatly with western advice to “get variety and moderation in our eating,” she says. And it may be why obesity is still relatively rare in South Korea: just one-third of adults are overweight or obese, according to recent estimates, versus 68 percent of Americans. Among the traditions that may help keep Koreans slim and healthy is including soup at every meal, which means filling up on a relatively low-calorie but satisfying food. Studies show that soup eaters tend to eat less high-calorie fare later. Also, treating meat like a condiment rather than the main event in a meal helps keep saturated-fat intake low. (South Koreans get just 20 percent of their calories from fat, according to surveys.) 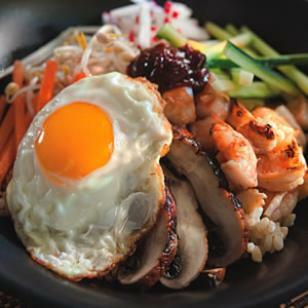 And, while Koreans are known for sophisticated beef dishes like bulgogi (grilled marinated beef), they’re also big consumers of heart-healthy seafood. Every meal also includes plenty of vegetables, most indispensably in the form of kimchi—robustly flavored, fermented vegetables. Besides providing phytonutrients and fiber, kimchi also supplies lactobacillus and other “good” bacteria that some experts think can help boost immune defenses. Usually made from cabbage and radish—vegetables in the cancer-fighting cruciferous family—kimchi is often lavishly seasoned with garlic and scallions (which, like other allium vegetables, are associated with lower cancer risks) and plenty of chile pepper, which supplies capsaicin, a compound shown to protect blood vessels and boost metabolism. That said, too much of a good thing can be harmful: heavy kimchi consumption has been linked with increased risk of stomach cancer, possibly due to the sodium and nitrates it contains.